Make it a kit. Add a color coordinated cloth. ***Please review your artwork before submitting your order as this will be the final proof before production. We will not be responsible for any errors submitted by the customer. 2. Select from hundreds of label designs and colors. Custom Bottle. Custom Color. Custom Label. 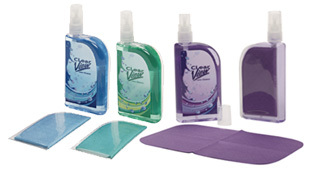 Our new Custom Clean lens cleaner offers the most versatile and customizable packaging in the industry. Custom Clean’s unique flat bottle design is convenient for handling and storing in pockets and purses. Then, we offer the widest color range of lens cleaner liquids to choose from. Lastly, select from our hundreds of label design and color combinations. Want the sleekest lens cleaner kit? Add a custom die-cut cloth in a plastic carrying case that sticks to the back of the Custom Clean bottle so it is always handy. The microfiber cloth features an embossed repeating pattern and rounded edges to compliment the elegance of the Custom Clean shape. Embossed microfiber cloth measures 6 x 3.5"